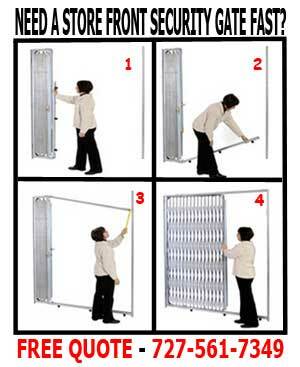 Maximum security storefront gates are an instant answer to loss deterrence and access control for any retail location. This particular store-front security scissor gate contains 2 times as much steel as our standard heavy duty security gates, utilizing a mixture of vertical bars and conventional scissor metal webbing to allow total coverage. Each folding gate is designed with a continuous frame on all sides for superior support, including both fixed, or folding top and bottom tracks. Our Store Front Security Gates come standard with a fully galvanized, weather-resistant finish and each steel gate is custom built correctly fit our clients required specifications, while providing safety and security that can fit into any budget.